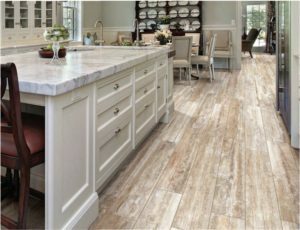 Porcelain wood-look tiles are becoming more and more common. A few reasons can be their resistance to water while bearing water spills, it is often a great solution when there are problems that prevent real wood floor installation, they are easy to install and virtually scratch proof. Besides, who wouldn’t want the real look of wood with extra flexibility? Wood-look porcelain tiles are often great choices for pet owners, households with young children or homes that tend to have high wear and spills. As opposed to hardwood floors, spills or accidents won’t threaten the installation. They should off course, be dried and cleaned up but because this is not wood, you won’t have to worry about spills causing the same severe warping and damage it would in wood floors. 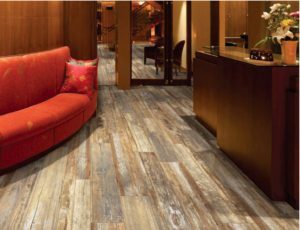 The second great thing about these tiles is that they are a great solution for rooms where you cannot have wood installed. For tenants that live in co-ops, you often either can’t afford the mess that installation can be to the other tenants or that there is literally no room (since wood needs to be installed on top of plywood) and most co-ops have a concrete slab subfloor. Tile can go directly on top of concrete and causes virtually no mess, since it doesn’t need to be finished on site. Are you concerned about your pet? You don’t have to be! They are less easily scratched than hardwoods, so your pet will be able to feel at home. You have probably heard that tiles are harder than wood, and that can be true, but there are solutions. You can find mats to make the floor softer and ease your back (in cases where you plan to stand on your floors for extensive periods of time). Another common concern can be the decreased warmth compared to regular hardwood. This can be remedied by installing radiant heat under your floors. We hope that the little of information is helpful in choosing your project.